Hello, everyone. We have a quick carpet cleaning London voucher code that entitles you to 50% OFF any of our services, not in conjunction with any other offer. Use this carpet cleaning voucher code: YJYK2Y27QFEH for 50% OFF any of our London services. The carpet cleaning voucher code is YJYK2Y27QFEH and is valid only today, 23rd of October, 2012. The code is valid for any of our services and is restricted to any area in London. 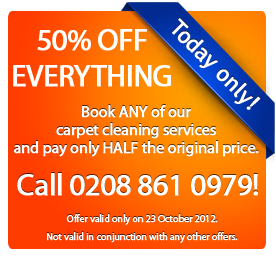 So hurry up, use this carpet cleaning voucher and give us a call on 0208 861 0979 for 50% OFF today! How does our booking system work? Which Is The Best Hard Floor Option?